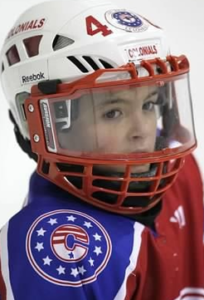 visual acuity, which is greatly impaired with a traditional wire cage mask your player is disadvantaged. When your player commits an error they might be distracted by things that are happening around them. Our eyes normally react to anything that happens in our field of vision-spectators, or other participants. Visual concentration is the ability to screen out these distractions and stay focused on the object or the target. Your player may be able to tune out external distractions but they can not over compensate for a wire cage permanently in their visual field. When playing with a puck or a fast-moving opponent, you need to be able to follow objects without much head motion. Eye tracking helps you maintain better balance and quickly react to the situation. Wire cages make tracking difficult. When a player sees their teammate out of the corner of their eye, They are using their peripheral vision. Much of what happens in sports does not happen directly in front of you. Therefore, increasing your ability to see action to the side without having to turn your head is important. Previous Previous post: Your vision is the key to playing hockey at peak performance. Next Next post: The Mirror test doesn’t make you look cool it’s actually slowing your reactions.